It was 2010. English singer and songwriter Harry Styles was 16 years old when he auditioned as a solo candidate for the U.K. reality music competition The X Factor. His Solo Mom, Anne Cox, had suggested he try out; he already had experience fronting a band called White Eskimo, and in the competition, he sang Stevie Wonder’s “Isn’t She Lovely.” Though he didn’t advance in the solo category, judge (and show creator) Simon Cowell saw how the audience responded to Styles and partnered him with four others—Niall Horan, Liam Payne, Louis Tomlinson, and Zayn Malik—who also hadn’t advanced in the solo category. Bingo: the band One Direction was born. The years since have been a whirlwind, with the band, often referred to as 1D, riding a wave of international success propelled by social media and five chart-topping albums. Songs such as “What Makes You Beautiful” and “Live While We’re Young” established the group’s cheerful pop sensibility while creating a base of ardent fans—many of them teen girls. As Cowell has said of the chemistry the five created, “They just had it. They had this confidence. They were fun. . . . They were like a gang of friends, and kind of fearless as well.” By 2013, a documentary and concert movie, One Direction: This Is Us, was released by TriStar Pictures. The film, which featured the song “Best Song Ever,” was a box-office titan, grossing more than $60 million worldwide and becoming the fourth highest–grossing concert movie. Styles has remained close to both his parents, who divorced when Harry was seven years old. He claims not to remember when Cox and his dad, Des Styles, broke the news: “Honestly, when you’re that young, you can kind of block it out,” he told Crowe, adding that divorce didn’t affect his relationship with either parent. “Feeling supported and loved by my parents never changed,” he said. Styles is protective of his mom, who has supported him since the early days. When the five 1D boys were getting to know one another during the X Factor finals, she welcomed all of them to stay for a week in the bungalow on her property, an experience they have said bonded them as a band. And during her son’s tenure on the show, she appeared in the X Factor audience every week wearing a “Harry has the X Factor” T-shirt. Being thrust into the limelight as the mom of Harry Styles has its downside: an avid Twitter user, Anne has fielded not only supportive comments but also the nasty vitriol of trolls. In 2016, she temporarily deactivated her Twitter and Instagram after someone hacked into her iCloud account and leaked hundreds of pictures of Harry. “Since I’ve been 10,” Styles told Rolling Stone, “it’s kind of felt like—protect Mom at all costs . . . My mom is very strong. She has the greatest heart. [Her house in Cheshire] is where I want to go when I want to spend some time.” If Styles is protective, he also celebrates his mother’s joys: he was best man when Anne married Robin Twist in 2013 and, as reported by Britain’s Sunday Mirror, couldn’t stop smiling at the event. Both mother and son have full plates these days. Anne has worked with organizations such as Believe in Magic to raise money for children in need of operations. In 2012, she hiked Mount Kilimanjaro with her friend Vicky in support of charity. And her efforts to restore a “little ship” from World War II, a campaign called “Save the Skylark,” were inspired by Harry’s role in the film Dunkirk, which is slated for a July 2017 release. 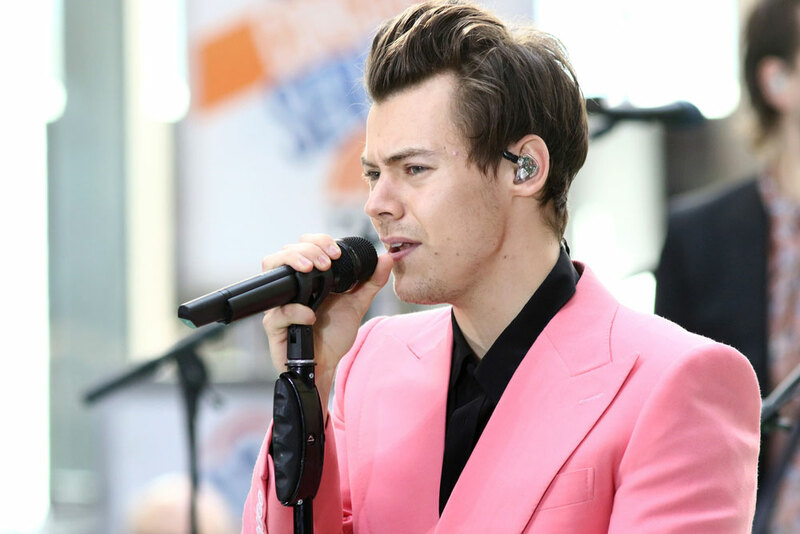 It’s a big year for Styles; while 1D has gone on “indefinite hiatus,” 2017 marks the debut of his first solo album, the eponymously titled Harry Styles, which dropped May 12. The 10-song cycle explores women and relationships, digging deep and laying bare the singer’s own experiences. “I didn’t want to write ‘stories,’” he told Rolling Stone. “I wanted to write my stories, things that happened to me. The number-one thing was I wanted to be honest.” Prerelease, he played the album for both his parents. When Anne heard it, she was sitting on a stool in the living room. She listened to the music through cheap speakers and started to cry when she heard her son’s song “Sign of the Times,” a piano ballad in which a mother tells her child to basically go forth and conquer.